Home / 2-factor authentication / News / SEO Services / 2-Factor Authentication Kaise Kare? How to Enable Two-Step Verification ? Gmail, Facebook, Twitter, Whatsapp & Instagram me 2-Factor Authentication? Hi friends! Do you know what is Two-Step Verification? How to enable 2-Factor Authentication? Despite increasing cyber attacks, there are very few users who are very concerned about their email, social media and other digital content. Even today, a large number of users do not use 2-Factor Authentication to keep their online/social media accounts safe and secure. Because of this often your accounts are hacked. So today I'm going to talk to you about this topic that is two-step verification? How to enable 2-Factor Authentication? 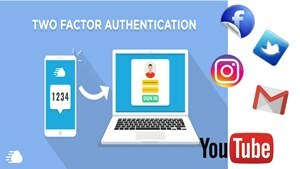 If you also want to keep your social media accounts secure, then read this Article- How to enable 2-Factor Authentication? till the end. Friends, first of all, we know that this is theWhat is 2-Factor Authentication? After that, we will talk that How to enable 2-Factor Authentication ? So let me tell you that these two terms are the same. Nowadays there are instances of account hacking happening. Some time ago more than five crore facebook accounts were hacked. Such incidents are rising rather than stopping. In such a case, 2-Factor Authentication becomes necessary, because it provides an additional security layer to the online accounts. The benefit of 2-Factor Authentication? Now let us talk about Benefit of 2-Factor Authentication? Whenever you log in to your account, you must enter the code as well as your mobile code; Then you will be able to log in to your account. In this way, if your password goes away, then the mobile is with you. After entering the password, it will be asked for a mobile one, which will not have it. In this way, your account will stay well. Often, due to lack of 2-Factor Authentication user hackers are easy targets. This is considered a safe and easy way to secure online accounts. Gmail is the most popular email service in today's time. You can use 2-Step Verification to keep this account secure. Its specialty is that even if someone knows your password, even then he will not be able to open your account. Because the verification code is required with the password to open the account and the verification code is sent to your mobile. You must first sign in at https://myaccount.google.com. Then click on Security. There will be a 2-step verification option. Then on the lower side, you will see Get Started's button. Click on it. To verify, you have to sign-in once more. Then you will see the option to turn ON for 2-Step Verification. Click on it. By default, Voice & Text Verification Message is sent to your registered mobile number. You can also use Google Prompt for smartphones. How to enable 2-Factor Authentication on Facebook? In today's social media, all people run Facebook. If you want to make the Facebook account more secure, then you can use 2-Factor Authentication here. To enable this feature, you must first log-in to your account. Then go to Settings in the upper right corner. After going to Settings you will see security and log-in options on the left. After clicking security and log-in, you will find change password and log-in options on the bottom. You will see the option of 2-Factor Authentication right below these options. After clicking on it, tap on getting Started. You will now have two options- text message & Authentication App. If you opt for a text message, you will have to enter your phone number. Keep in mind that the verification will be sent to your corresponding number for verification. After entering the number, there will be a code on the phone. When entering the code 2-Factor Authentication will be Activate. In addition, you can also use the Google Authenticator App for authentication. How to enable 2-Factor Authentication in Twitter? You can use Login Verification to secure your Twitter account. The verification code is sent to your mobile phone. To enable log-in verification on Twitter, the email address and phone number must be confirmed first. After logging in to the account, click on the profile icon, then go to Settings & Privacy. Tap the account option here, then go to Setup Login Verification. After reading the instruction click on Start. Then the password must be entered and verified. After clicking on the send code, the verification code will go to your number. Then put that code and submit it. Here, you can generate backup codes, which can be useful if you lose mobile. After this, whenever the account is logged, the 6 digit code will be sent to your mobile. You can also use third-party verification apps for login-verification here. How to enable 2-Factor Authentication in Whats App? If you want, you can also use 2-Factor Authentication for the security of Whatsapp. Now the option of payment in WhatsApp has also come, in this case, it becomes more necessary. To enable Two-Step Verification on this platform, you must first go to Settings. After taping on the account here, the option of 2-Factor Authentication will be visible. By clicking on it, you can enable this feature. However, for this, a 6 digit PIN has to be generated. Also, you have to enter your email address here too. If you forget your PIN, then it can be beneficial in that situation. How to enable 2-Factor Authentication in Instagram? Instagram is running more than Facebook today. Users can also use 2-Factor Authentication with their Instagram account. After logging in, you have to go to settings. After clicking privacy and security option here, you will get 2-Factor Authentication in the lower security option. After clicking, Get Started button will appear on the bottom, click on it. If you choose the option of the text message, then the login code will be sent to your mobile, through which you will be able to open the account. If you choose the Authentication app option, then the authentication app must be installed on your mobile. Conclusion: How to enable 2-Factor Authentication? So Friends! That's what two-step verification process. I hope you have enjoyed this article Two-Factor Authentication on Gmail, Facebook, Twitter, Instagram & Whatsapp. And now you might have also come to know that How to enable 2-Factor Authentication? If you have any questions related to doing Two-Factor Authentication, be sure to comment below. If you want to read similar and read Techtox Express, you can follow us.